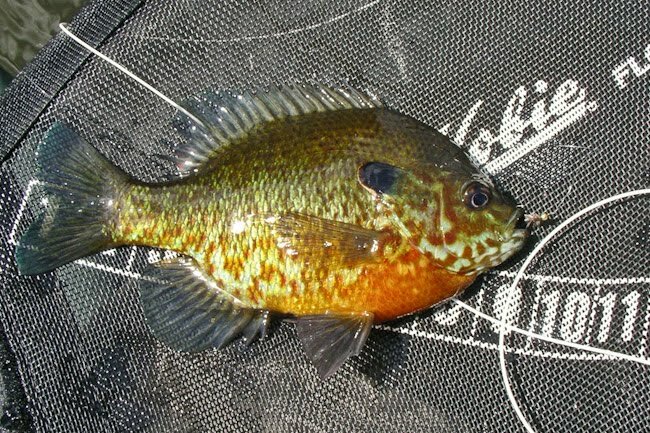 Every year I look forward to my first day on a local farm pond my brother calls "The land of the Nuclear Sunfish". That's because the sunfish are very large here, especially for New England. On this first outing of the year I caught more small ones than usual, but nevertheless most measured an honest 8.5" to 9.5" in length. The largemouth bass here are big too, and I do catch a fair bunch of smaller ones (under 14"); but mostly the big ones are there for the baitcasters who can stand in their boats and yank them out of the weeds. 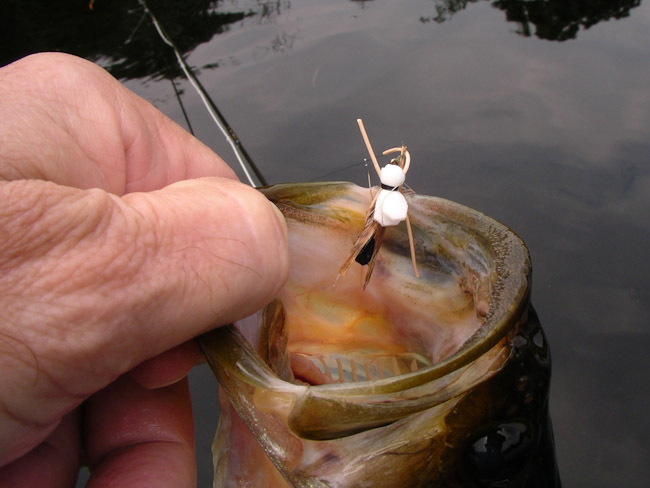 We're all helped by the fact that this is a catch-and-release fishery. This is a float tube pond. Wetlands surround the pond and the lily pads around the circumference is dense. Fortunately there's a dock that I can use to get myself in and out of the water. From here I usually take about 3 hours to circle the pond once, in counterclockwise fashion, then I go home. 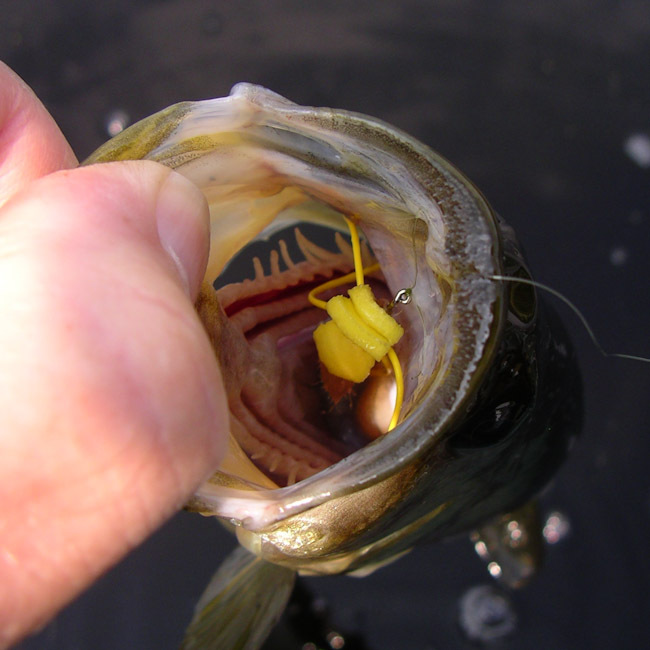 The yellow gurgle-pop popper has always been my favorite for surface play. These sunfish like big flies, so I tie my foam poppers on a size 6 barbless (Cabela's) dry fly hook. 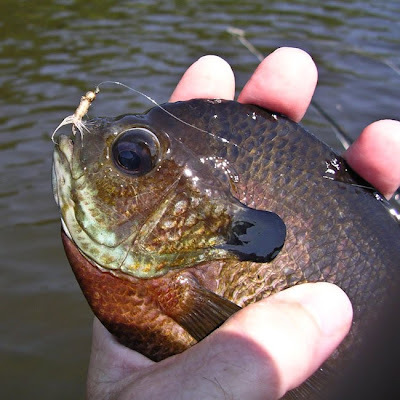 The size of the hook may be one reason I catch the bigger sunfish (and why I catch generally the smaller bass). 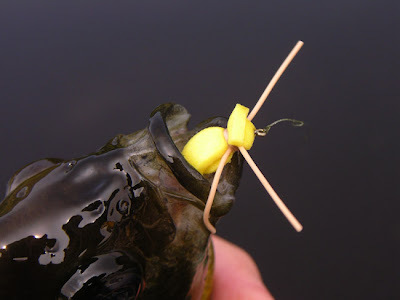 I often fish an entire outing with nothing but this size 6 yellow foam popper. But this day I had a new experience. 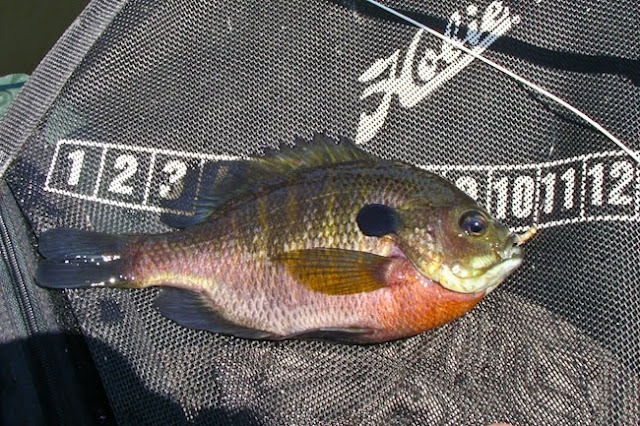 Half way through my morning I lost the third and last guggle-pop in my box, when a very large (I presume) bass broke me off around lily pads. Searching my box for anything foam, I spied in the corner two samples of a foam hopper pattern I had first tied when "razor foam" was a new product. I hadn't fished this pattern for a while. And, when I last used it, it was probably on a smallmouth river. 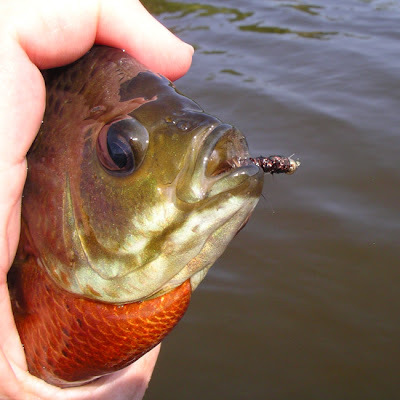 Long story short, the fished loved this fly. It's thinner than my poppers and due to the bullet head it will not "pop". Maybe this, or the black body, are the features the fish were attracted to! The sad news is that I lost both of these foam hoppers before I finished fishing; but the good news is that the second one was lost just minutes before reaching the dock to go home! 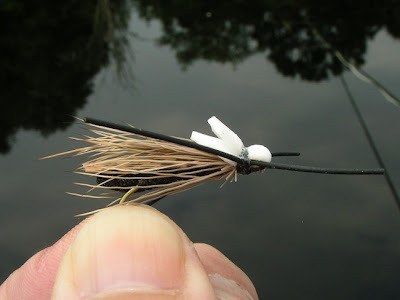 It's been a while since I have tied flies, but now I will have to: Gurgle-pops and foam hoppers! 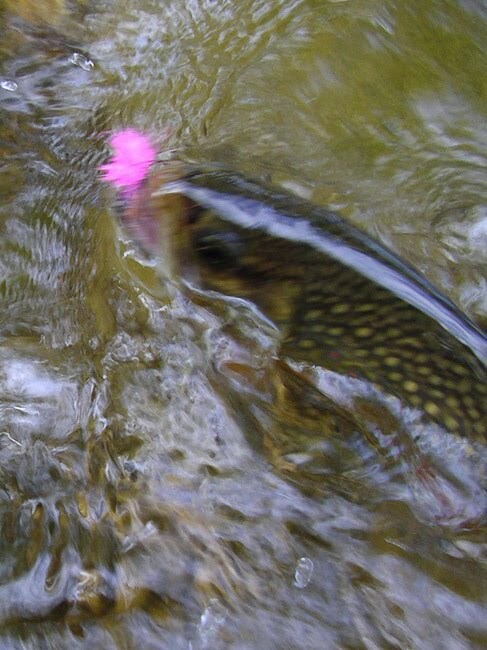 Not caught with a foam popper or hopper, I did catch a few on a streamer early in the day when the water was coolest. 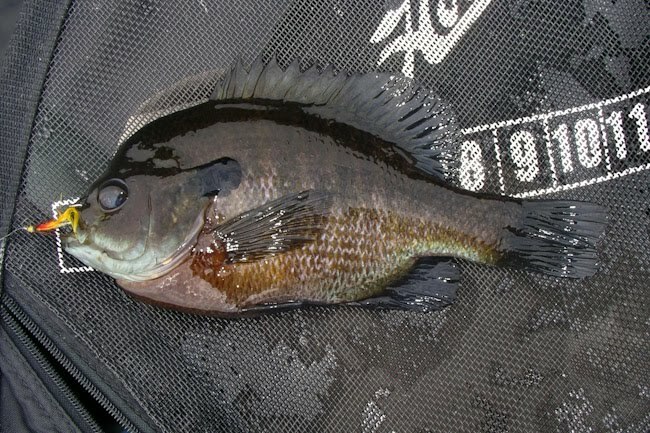 This bluegill is nearly 10" long. It was the catch of the day. 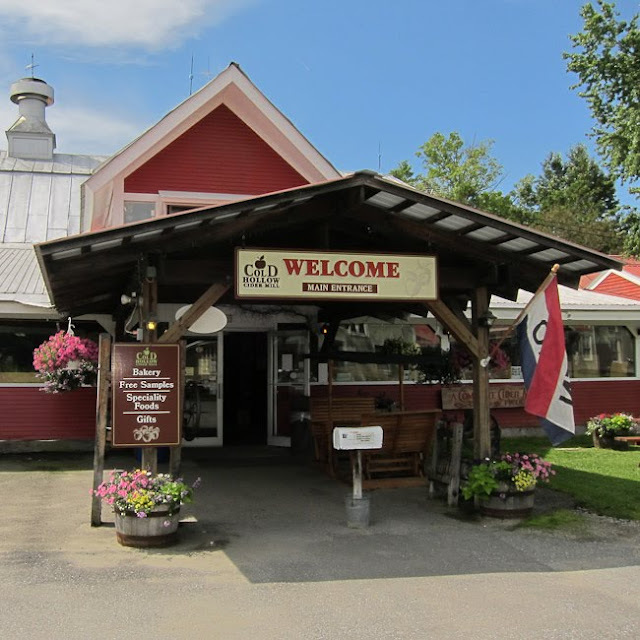 Last week I took my annual trip to Vermont with my friend Paul. 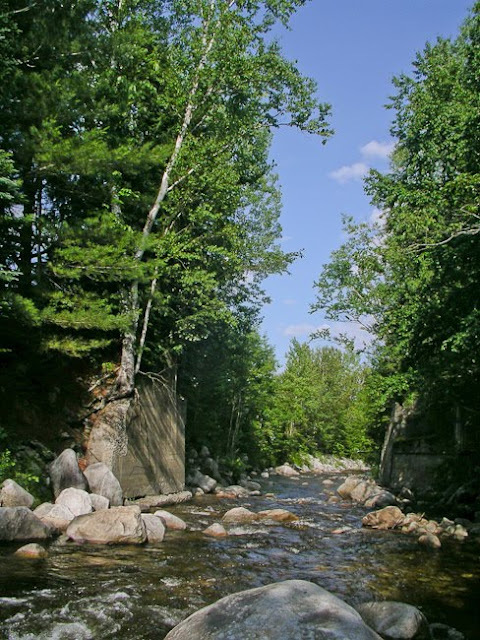 Paul enjoys frequent day-treks north to Vermont and New Hampshire from his home south of Boston. It's a heck of a lot of sitting for a day trip, even with Paul doing all the driving, so generally two or three one-day trips per season is just the right amount for me. 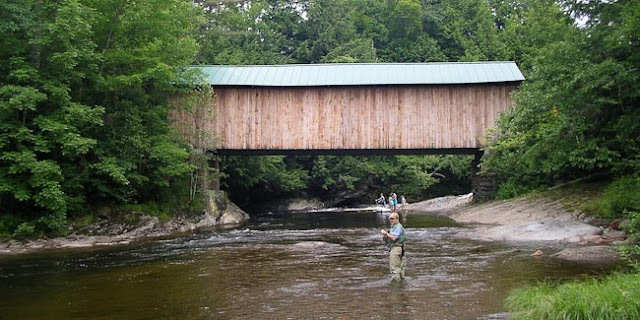 Paul has been fishing small streams in Vermont for nearly 40 years, so he's a great guide. He's currently working on a small stream fly fishing book, which will be published by the folks from the magazine On the Water. I'm flattered that he's asked me to supply some photographs. I'll keep you posted on his project. On this particular trip it was just Paul and me. But frequently we squeeze three people (driver plus two) into Paul's Suburu Forrester. Talking is the main activity in the car. Lot's of good conversation. (I remember when we were lost driving backroads in Vermont at night two years ago, we had a rather long and indepth conversation about ice cream.) 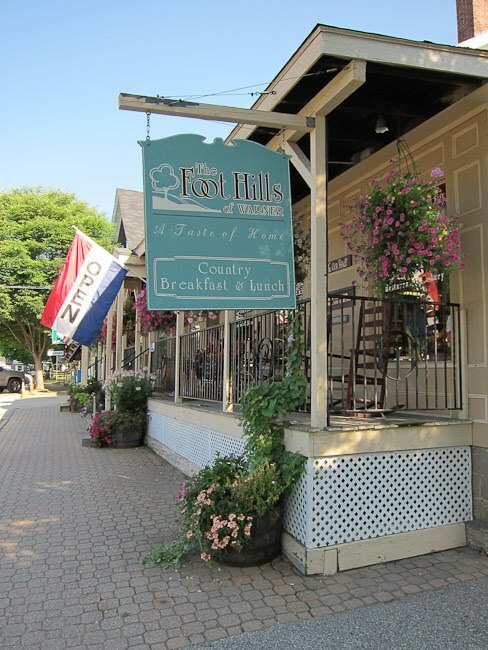 We normally reach Warren, NH off of Rt.89 around 9 am for breakfast at the Foothills. 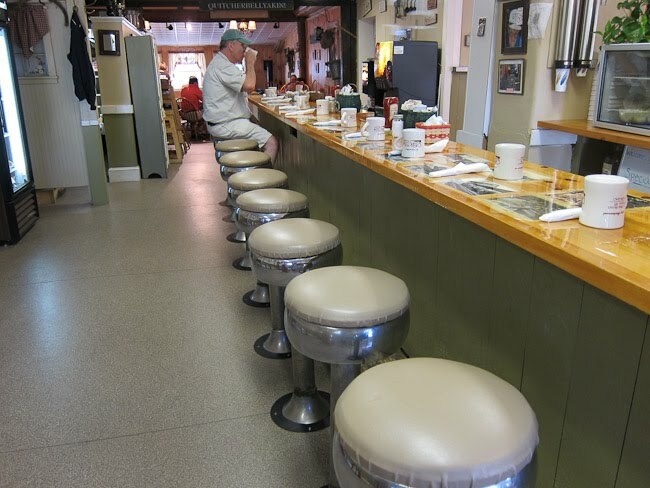 On weekends there's a hefty waiting line, but on Friday after 9 am we had the place to ourselves. 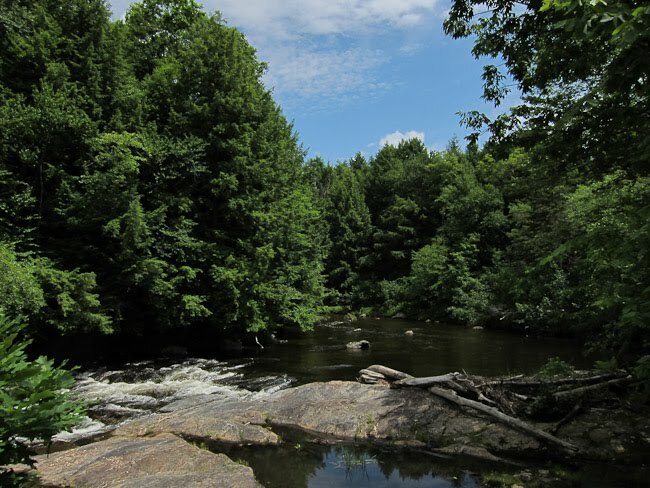 Then its on toward White River Junction where we cross the Connecticut River and enter Vermont. Today's trek was going to be a long one. Paul wanted to show me the Lamoille River, north of Burlington in what is known as the Northeast Kingdom. I don't know exactly where we were but it was near the covered bridge shown below, when we started fishing. Generally, the plan is to get one or two hours of fishing before a late lunch of sandwiches, chips and fruit from the cooler. Then a few more hours of fishing until dinner. And finally an evening of fishing the hatch, until dark. Getting home at midnight is typical. This day we made a couple of stops before we started fishing. 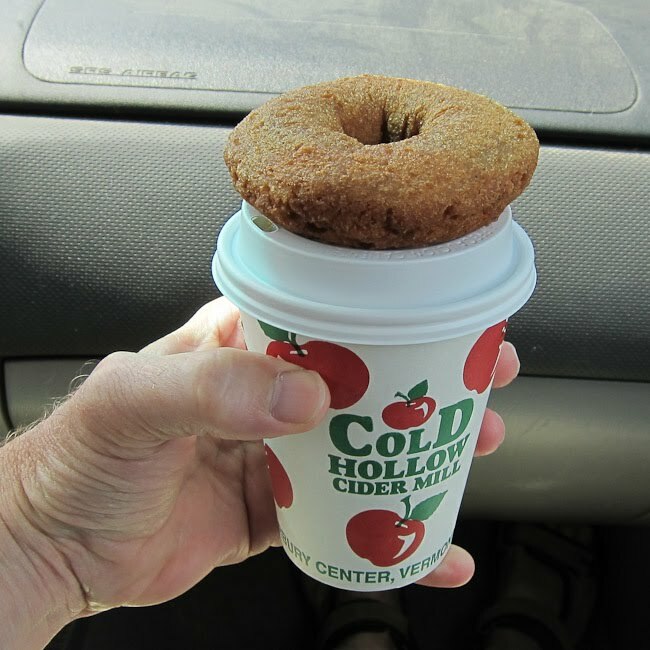 Though my breakfast of scrambled eggs, sausage, and homemade wheat bread had been perfectly adequate, I decided I needed to partake in another cup of coffee and a fresh apple cider donut from the Cold Hollow Cider Mill. Paul stops there whenever he is near, to buy a dozen doughnuts or two to take home to his family. 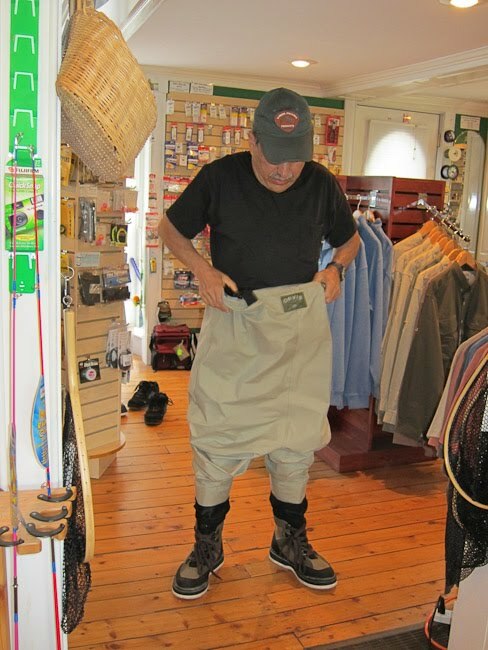 We also stop at local fly shops to find out more about water conditions. 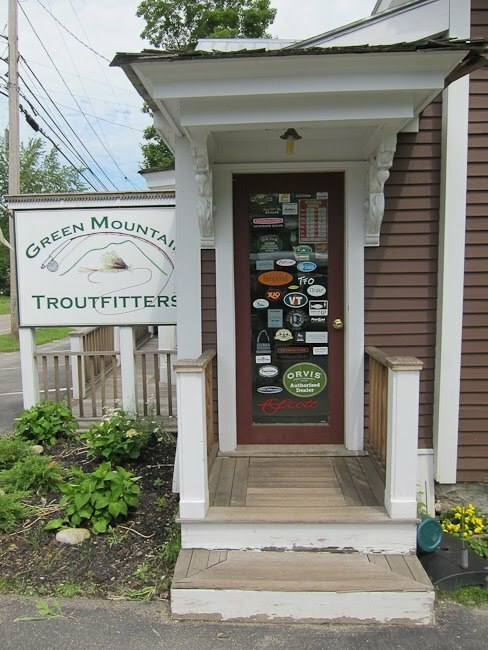 In this case it was Green Mountain Troutfitters. Unfortunately we were to find out that the water was a bit high and discolored due to rain the prior night. I was very impressed with the completeness of this little fly shop and guide service. Paul bought some waders. As good as the water looked on the Lamoille, neither of us were able to turn a single fish during a couple of hours of trying. We covered a lot of water with Paul going upstream and me going downstream, but nothing was moving. So, we got out of our waders and drove east toward St. Johnsbury and then south along the NH/VT border. We finally settled in on a small stream on which Paul has never seen another angler. Here we had some luck. Nothing to really brag about but I think we were both happy to hook 7-8 native brook trout apiece. By then it was about 5:30 and together we decided that it was unlikely that there'd be an evening hatch, that we'd had a great day, and that we'd take a slow drive home. I got home about 9pm. Not a lot of fish for a long day, but the more I fish the more I realize that (for me at least) it's not about the fish. It's about the day. Native brookie takes my parachute. This is my favorite dry fly for small streams. It's a bit bushy and this sample is definitely not "exhibition" quality. 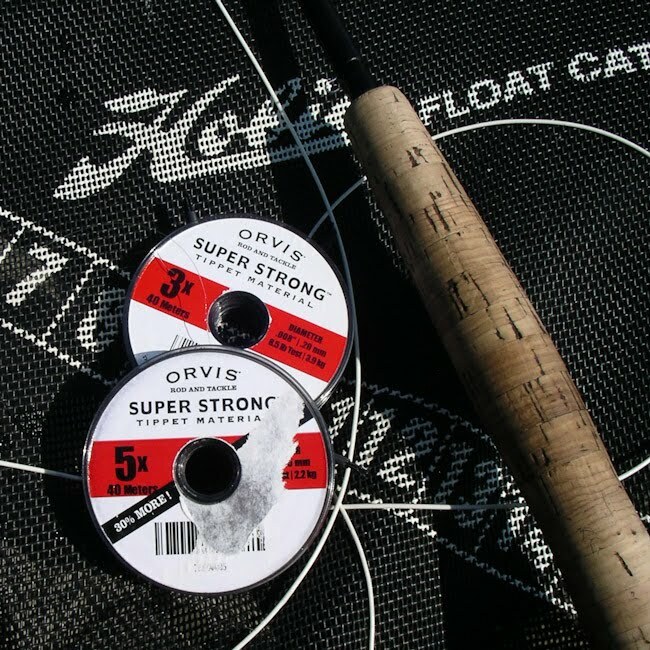 But the bushy parachute post really helps me follow the fly as it is landing and as it drifts in and out of shadows on water that is usually a bit frothy or bubbley. Difficult to tell because the body is wet, but it is made with 3 or 4 stands of peacock herl, wrapped around the shank. 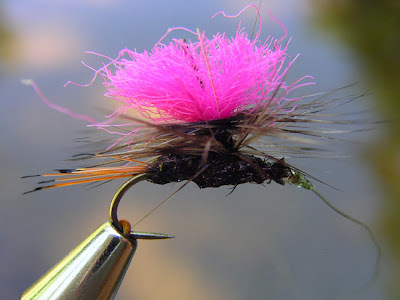 This one lasted the entire day and I never switched flies. It caught 7-8 brookies and an equal number of low-lying tree limbs.